During the 1930`s a group of artisans gathered to share their interests in the arts, and Mrs. H.J. (Ethyl) Bolinger, artist and benefactor perceived a need for a gallery and dedicated gallery space on Pine Street to the "Lodi Art Club." Mr. and Mrs. Alby Lind, owners of the building, donated the rent. During the 1940`s the "Lodi Art Club" became the "The Lodi Community Art Center," often shortened to Lodi Art Center. In August, 1960 the organization was incorporated (501c) as "The Lodi Community Art Center," a non profit educational organization "to encourage as interest in, and study of, the arts." When the property was sold in 1962, meetings were held at a house at 107 W. Lockeford Street. The organization then moved to the renovated Old Lodi Union High School at Hutchins Street square in 1982, first to the locker room and then to the old music room. In 1996 the organization left Huchins Street square to make for additional reconstruction to the theater and fine arts building. The center was offered space on Ham lane in Lakewood Mall and stayed there until it had to move once again. A nice home at Vino Piazza in Lockeford was short-term due to zoning laws. After several years on Church Street in Downtown Lodi the center returned to Lakewood Mall, where it has a studio and attractive gallery. Prior to World War 2, the Lodi Art center`s first Art Annual show was held at the Lodi grape festival Grounds. The second Art Annual show was in the foyer of the Lodi Women`s Club. By 1965 the Art Annual was held at Barengo Winery and displayed the paintings on the old wine barrels. During its Hutchins Street Square years, the Art Annuals were held there. Beginning with the 38th Art Annual in 1997, the show has been held at the Woodbridge by Mondavi Winery in Woodbridge and has become a major cultural event for the area. The Lodi Community Art Center has gained Statewide and national recognition for our members achievements and contributions to the community. many blue ribbons have been brought to Lodi by the members and the organization continues to reach out to the community with shows, demonstrations, and speakers. A February 1958 photograph on the newly organized Lodi Community Art Center. The sketch class is meeting at 14-1/2 Pine Street, upstairs in old downtown, where the group had a meeting place and gallery during its early years. Ethel Bolinger, Maryly Wallof, Leslie Wiederrich, Julie Nordquist, Carl Klafke, and Richard Hieb are pictured according to the Lodi news Sentinel. 1997 Art Show among the barrels at Barengo Winery in Acampo, where the Lodi Spring Art Annual was held for many years. 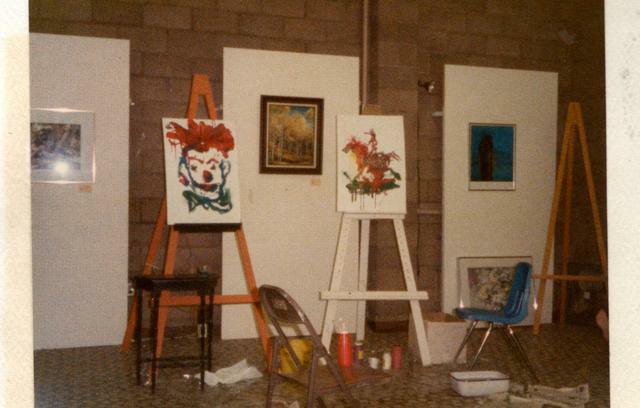 The brush-off competition from 1984, when Lodi Community Art Center artists competed against Stockton Art League painters doing a quick work of art in tempera paint. The topic was always drawn from a list of suggestions, and the three artist who painted for each team were given only a couple of minutes to plan, then they each had a turn at the painting, relay style, with a timer running. I would guess the topic for this set of paintings was the Clements Stampede rodeo, with the horse and rider by LCAC and a rodeo clown by SAL. Adapted from "the Lodi Community Art Center, Past and present" by Virginia Rippey. * As an addendum to this history we might add that in the days prior to the Losi Arts Commission and the Lodi Arts Fund, it was the Lodi Department of parks and Recreation which often procided cooperation and support to projects of the Lodi Community Art Center, an independent non profit 502(c)(3) corporation made up of artist and art supporters.